Has anyone written any, or ever wanted to write some? hedley fanfiction seems to be kind of hard to find. i've never written any, but i've thought about it. there was one forever ago about jake being like ... deformed and living in the mountains or something. anyone else remember it? it was really good, haha. Jessica wrote: there was one forever ago about jake being like ... deformed and living in the mountains or something. wait, i think i might have read that one. it was about hedley., right? god, that was so long ago. Krysten posted that one back in 2005 and it was about hedley. - Jake, Kevin, Kevin, Ryan and Brandon. I don't there's ever been one for Hedley. I might still have it but don't think so - will check. Krysten -- did you happen to keep that fan fiction? You worked so hard on it! And wasn't there two different ones? 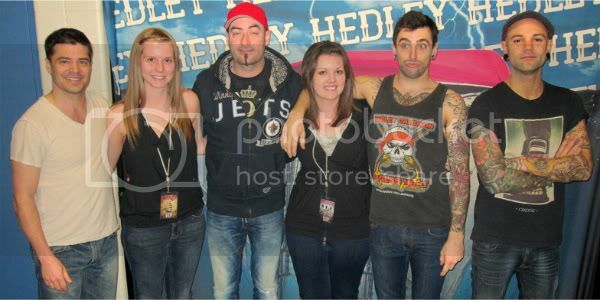 Haha, hedley. fanfiction?? And Jake deformed and living in the mountains?? This sounds too good to be true, I hope someone still has it, I'd love to read it! oh man, i LOVED that. It's the one with Ryan obsessing over his hair straightener that starts out with them licking envelopes in kevin's basement? Haha it's really funny... A bunch of people went into writing it, I think it's 04, maybe early 05? PM me if your interested in having it, I'll send it over! LOL ... I'm sure I read it, but would enjoy doing so again. So you have a PM. wow Hedley Fan Fiction? I'd love to read some if there's any out there. I'm not used to fan fics based on real people lol. Darn! I'll have to check my stuff but I'm sure I didn't keep them. I remember printing the one - I think it was Jake being the bad boy on probation ??? - and reading it on the flight to Vancouver when we all went for the January 05 Mesa Luna show. I found a Fan Fiction (not sure which one it is) on one of my CD's ..
steve wrote: I found a Fan Fiction (not sure which one it is) on one of my CD's .. This is the one where Jake is in a bus crash and disappear/hides out in the mountains and take refuge with an elderly lady. It's hedley. based.